Globe Electric's 5-Piece Parker All-In-One Bath Set is a wonderful way to update your bathroom with one easy step. Combining a modern refined vintage look with an industrial pipe look, these pieces will update any space. 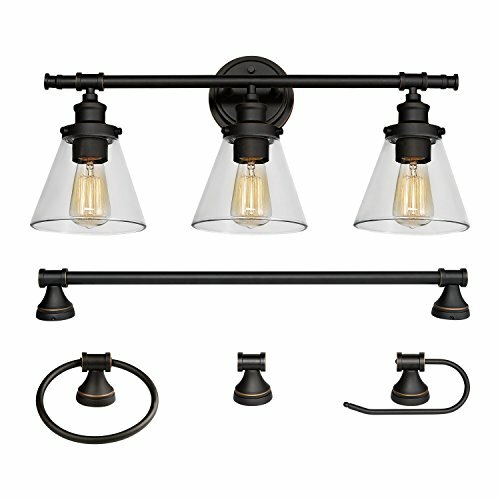 Complete with a towel bar, towel ring, robe hook, toilet paper holder, and 3-light vanity fixture with thick clear glass shades in a vintage and sleek oil rubbed bronze finish, your bathroom will look streamline and welcoming. Add a compatible dimmer switch to your vanity fixture to create a warm ambiance for a relaxing bath. While the pieces complement each other you can split this set up and use it throughout your home. The towel bar makes an excellent shoe holder. The towel ring would be great in your kitchen. The vanity light would work in your bedroom. Think outside the box! Three medium base 60W bulbs are required and sold separately. The towel bar measures 20.87" long and sits 2.72" from the wall. The towel ring is 6.1" wide, 6.88" tall and sits 2.72" from the wall. The robe hook is 2.2" wide at the base and sits 2.2" from the wall. The toilet paper holder is 6.69" wide and sits 2.77" from the wall. The 3-light vanity is 24.63" wide, 11" high and sits about 7.92" from the wall. Each shade is 6.5" wide and 5.32" high. LED Smart Base,7 Colors Automatically Transform,Can Fix a Color, 3D Crystal Ball,Glass Jewelry Accessories.